HDR photography doesn’t have to be just HDR. Let me explain. When I got my first DSLR many years ago, I discovered HDR at around the same time. I was drawn into the HDR effect back then rather than the technique itself. Before I realized, I had turned all my images into HDR by bracketing every single thing I photographed. This went on for several years until I got lost. The brainless routine of bracketing, merging and tone-mapping got me thinking if there was nothing more to HDR and photography than this. It made me lose interest in the art and I almost packed my camera away for good. Then, everything made a turn of an event when I learned about exposure blending. It opened a whole new world of possibilities for me. From there, I developed my own style and continuing to experiment with HDR to produce more natural looking and creative images until today. One of the techniques I’ve streamlined in my very own way was combining focus stacking and exposure blending. 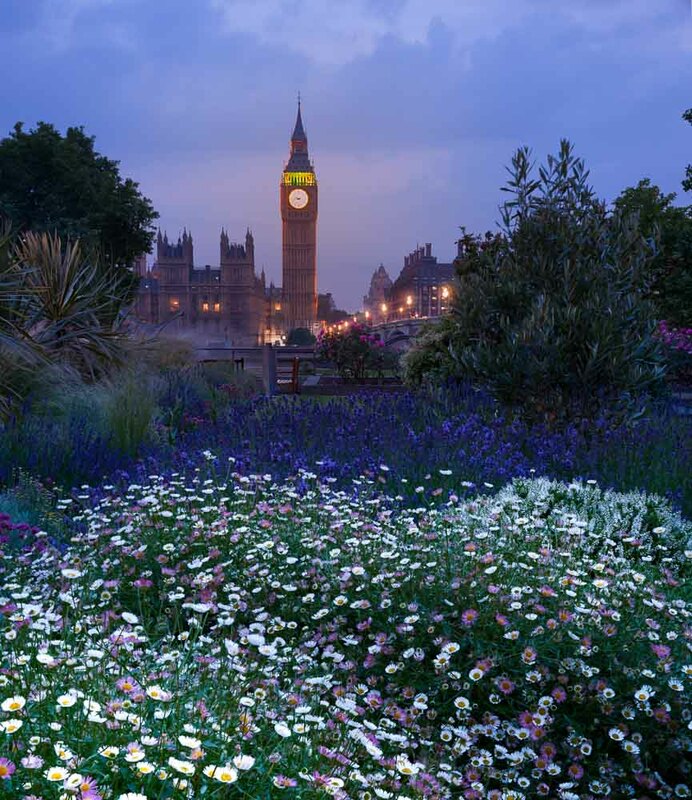 In this post, I’m going to share with you how I create this image of Big Ben using focus stacking to keep everything tack sharp and exposure blending to bring back the highlight details in the background. 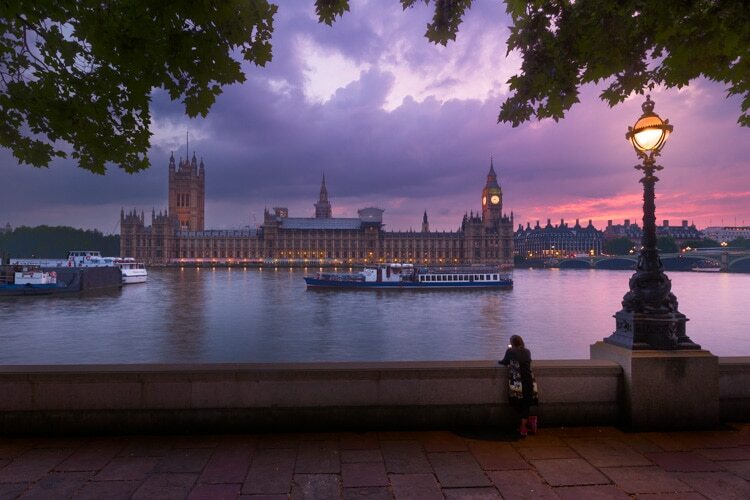 London is an amazing place to photograph. Just like any metropolitan city, it’s unique in its own way - multicultural, vibrant and full of endless surprises. 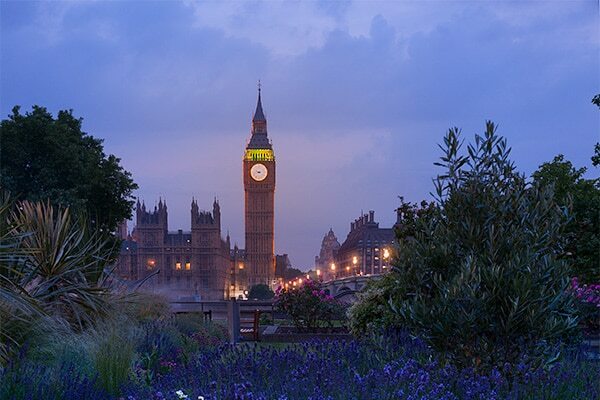 When you hear the word London, you probably start picturing Big Ben in your head. It’s truly a remarkable structure with a stunning architecture and you really have to see it yourself to be awed. Because of its status, it is also one of the most photographed landmarks in London and probably the world. A quick visit to the internet and you’ll find thousands of images on Big Ben taken from literally every angle you can imagine. So, when I was strolling leisurely along the Thames river in Westminster, I wasn’t planning to photograph Big Ben because I didn't want to take "just another photograph" of Big Ben. 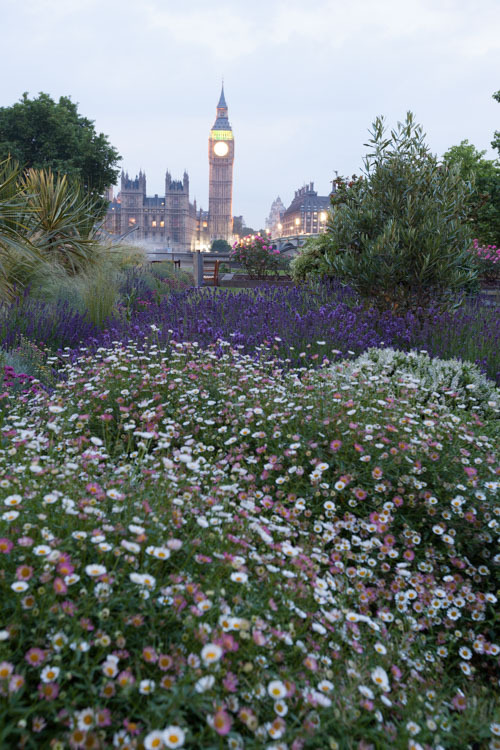 But as I crossed the bridge to the other side of the river, I noticed the garden full of floewers by the entrance of St Thomas’s Hospital. It reminded me of some landscape images I have seen in the Dolomites where there were wild flowers in the foreground with the towering mountains in the back. 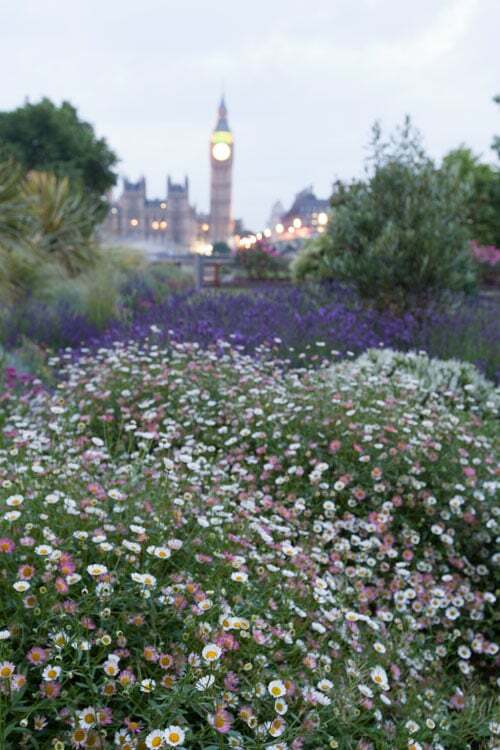 That thought inspired me - I thought could use Big Ben as the background to complement the flowers! The flowers were by the walkway leading to the main entrance of the hospital. It was in the evening but there were still people going in and out and I didn’t want become an obstruction. So I kept myself to the side close to where the flowers were. Just as I looked through the viewfinder of my camera, I realized I was very close to the foreground and I couldn’t get the whole scene into focus - it's either the foreground or the background. At the same time, Big Ben was too bright and slightly overexposed. 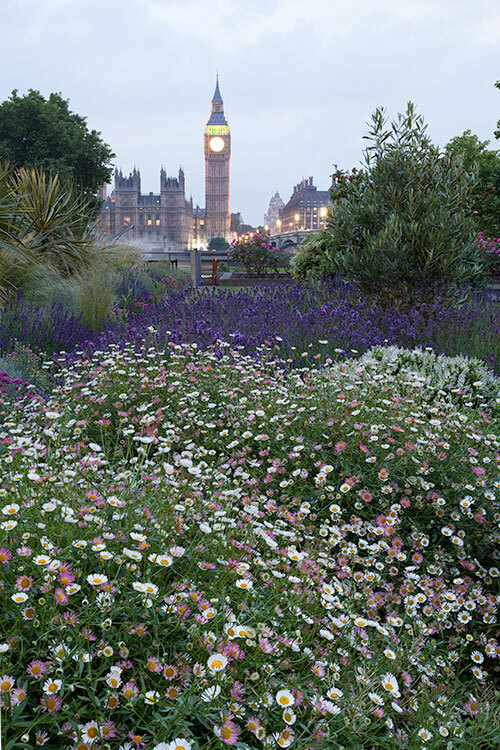 Because it was a really a unique perspective to see Big Ben from here, I wanted good sharpness throughout the image to show the flowers and Big Ben at the same time. The only was I could achieve this is by using a technique called focus stacking. For those who have never heard of focus stacking, it’s a way to maintain sharpness throughout, from the front to the back of the image. The technique consists of two parts: (1) shooting multiple images with sharpness at different distance, and (2) combining these images in post-processing to produce a single file with sharpness throughout the image. Normally, there are two reasons why you need to do focus stacking. The first one is when you want to overcome the limitation of your lens such as in this case. When the foreground is close to the camera, the only way you can get sharpness throughout the image is by focusing them separately and combine it in post-processing. Another scenario where you might need focus stacking is you simply want to make sure you have the maximal sharpness throughout the image. You can do focus stacking using a camera with exchangeable lens and the lens has to have the ability to focus manually. Most DSLR and mirrorless cameras fit these criteria. Mount your camera on a tripod and compose the image. Switch the lens to manual. However, you can shoot in any mode you like - Av, Tv or manual. Shooting focus stacking is best done viewing the image on the LCD screen and zooming in. If you have a mirrorless, that’s pretty much your default viewing mode anyway. If you have a DSLR, switch it to live view. Visualize a straight line from the bottom to the top of the screen. This is going to be the “line of focus”. Starting at the bottom, zoom in maximally. Your screen should now be filled with only a small part of the image but at maximum zoom. Without changing the focal length, turn the focusing ring until the scene at the bottom of the “line of focus” is in focus. Take a shot. Now move the view up along the line of focus until the scene becomes out of focus. Stop there and turn the focusing ring to make it sharp. Now, take a shot. Repeat step 5 and step 6 until you arrive at the top of the line of focus. Bracketing focus is part one of two of the workflow in focus stacking. Now that you’ve taken the images, it’s time to merge them together. I’m going to show you how it’s done in Photoshop, but you can apply the same principle to merge in other image editing software. Open all the bracketed images in Photoshop and stack them into layers. You should now have a single file with all the images in layers. Align all the images by going to Edit > Auto-Align Layers. Even if you've used a tripod, I would still do this step to double and triple make sure all the images have the same composition and framing. To merge the images for focus stacking, go to Edit > Auto-Blend Layers, select Stack Images and hit ok. Photoshop will merge all the sharpest part of your images together. Now, you should have an image that is tack sharp from the front to the back! If your learning style is more tactile-kinesthetic, you can download this PSD file to see how focus stacking works in Photoshop. It’s totally free and you don’t need to subscribe. While I was shooting for focus stacking, I did notice the background was too bright with some clipping in the highlights. My instinct told me to bracket exposures and I did. But how do you do focus stacking and HDR at the same time for the same image? It’s easy. You bracket exposures for HDR only for the part of the image that needs it. In this case, the background. When I’ve moved to the top of my “line of focus” where Big Ben is, I bracketed three exposures for HDR. Basically, I was doing HDR only for the background, which also happened to be the last frame for focus stacking. Once I have the focus stacked image, I blend in a darker exposure to the background to recover the blown highlights. If you're are not familiar with exposure blending, you can check out this guide on exposure blending and the building blocks of blending where I break down the components of blending multiple exposures. Finally, let's look at the before and the after (I cropped the final version of the image). As you can see, HDR doesn’t have to be just HDR. You can combine it with other techniques to keep things intersting. In this post, I’ve shown you how to do it with focus stacking. I hope this gives you some idea for your creativity! Being creative with HDR photography is what I strive for. I like doing HDR with exposure blending because it allows me to bring back tones and colors more naturally that otherwise would have been lost with just a single exposure. Personally, I feel the results of HDR is unparalleled even if you use a camera with the best dynamic range on the market today. Although you can recover highlights and shadows details in post-processing, the quality of these details will never be the same when you blend it from an image properly exposed to that part of the image. Until the technology allows me to capture the whole dynamic range in one shot, I’m going stick to HDR photography for now. Thank you! I learned how to do focus stacking and exposure blending but I was wondering how to combine the two. A quick search and I found your article. Well done, thanks!